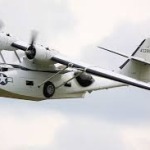 Knowing my interest in WWII aircraft, some friends recently forwarded a video about the restoration of a PBY 5A Catalina, a real workhorse of prewar and wartime Pacific air power. 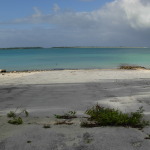 Many PBYs landed on Wake Island’s turquoise lagoon in 1941 and the contractors were building the naval air station as a base for this type of plane. The U. S. Navy used the versatile PBYs for patrols, scouting, and when war was underway, for search and rescue operations. Not as flashy as the big wartime bombers and nimble fighter planes, the PBY didn’t capture the imagination of aircraft aficionados in the decades after the war. Crowds still flock to see lovingly restored B-17s and Corsairs on the summer tour and flight show circuit, but the lowly PBY never made the big time. It’s not the kind of plane you’d paint with snarling teeth or a buxom pinup girl, but it’s sure worth a second look. The seven-minute film features recent flight footage of a rare, restored PBY Catalina, the type of aircraft credited with spotting the Japanese aircraft carriers at sea in the tide-turning Battle of Midway in June 1942. Jim Slattery, who located the plane in South Africa and had it restored for display in the Greatest Generation Naval Museum in San Diego, CA, describes the structure and functions of the PBY in the video. There is some beautiful modern flight footage and many archival photographs. The PBY is an “ugly duckling that you can’t help but fall in love with,” says Slattery. It is obvious that he did. Please watch the PBY video here. It has been widely shared on the internet, but I wanted to be sure to give credit where it is due: Barry Schiff of the Aircraft Owners and Pilots Association, AOPA Live, and Ooyala Video. The PBY plays a minor role in my book, but viewing the film footage I was reminded of its important role on prewar Wake and Midway, both under construction as naval air stations specifically for squadrons of these patrol planes and their tenders. Difficult dredging operations plagued both projects as the contractors endeavored to carve access channels, seaplane runways, and turning basins in the obstinate coral. I realized that I too had allowed the flashier Pan Am Clippers, Army Air Force B-17s, and the Marine squadron of Wildcat fighters to take center stage and had to look in my own index to find out what I had written about the PBYs themselves. 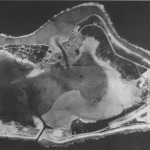 Little remains of the prewar American construction project on Wake today, most of it obliterated by American bombs during the Japanese occupation, but the broad expanse of the seaplane ramp and parking area on now-deserted Peale Island stand as mute testimony to the valiant but futile effort. 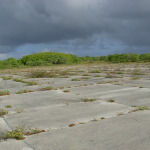 The ramp and park have generally been linked to Pan American Airways, probably because of the proximity of the Pan Am station and hotel that stood close by before the war. However, my research for Building for War revealed that they were products of the contractors’ naval air station project. 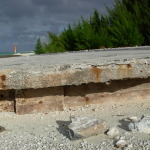 Indeed, my grandfather Harry Olson pioneered the “pre-fab” construction of the ramp and his good friend Walter “Swede” Hokanson, as the waterfront superintendent, implemented it on Wake – none of it an easy task on a remote atoll. One of my favorite memories of my visit to Wake in 2011 was exploring Peale Island. 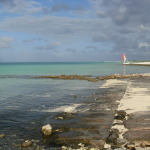 The wind pushed our little Hobie Cat quickly over the lagoon to Peale one afternoon, and I went straight for the seaplane ramp, examined the rough edges and climbed up to the concrete parking area. Hermit crabs skittered across the flat slabs and the distant break of the surf filled the air, but in my mind’s ear could I hear the roar of engines, the shouts of men, and the ring of hammers. Thanks to the PBY video I can bring my mind’s eye to the scene now.